BGA is a typical high-density packaging technology. Its characteristics are that the chip pins are distributed under the package in the form of spherical solder joints, which can make the device smaller, more pins, larger pin spacing, higher assembly rate of finished products and better electrical performance. Thus, the application of this kind of packaging method is more and more popular with the market. Currently, BGA soldering quality detection methods are very limited. Common detection methods include: vision inspection, flying needle electron testing, X-ray detection, dyeing detection and section detection. Among them, dyeing and section detection are destructive detection, which can be used as failure analysis methods and are not suitable for soldering quality detection. In nondestructive testing, the vision inspection can only detect the edge of the ball, not the internal defects of the solder balls, and the false rate of the flying needle electron testing is too high. While the x-ray detection is the most effective method to detect the quality of BGA soldering, which can well detect the soldering situation of those solder balls hidden under the components. BGA devices typically have several hundred solder balls and may have multiple soldering defects simultaneously. Therefore, engineering experience and reasonable testing process are very important. The common testing process is shown as below. Both defects are easily detected by two-dimensional X-ray examination. 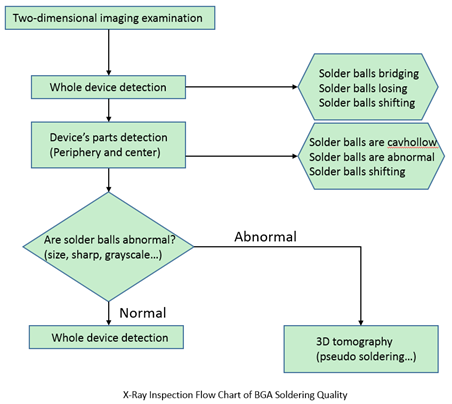 It is often easy to detect the presence of solders ball bridging and solder balls losing simply by observing the whole BGA device. The displacement of the solder ball is represented by the overall distortion of the BGA solder ball in one direction. This defect is easily observed by X-ray examination, and more importantly, the severity of the solder balls shifting needs to be detected. This requires amplifying the BGA and adjusting parameters such as X-ray intensity and image contrast to make the image clear enough, while measuring the deviation of the ball center from the pad. 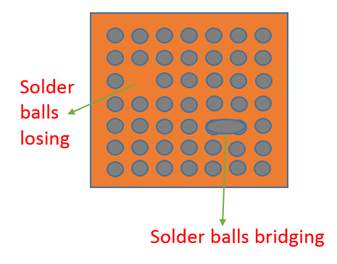 The figure below is a two-dimensional top view of the solder balls shifting. Where, L is the distance from the center of the solder ball to the center of the solder pad, and D is the diameter of the solder pad. The calculation formula of solder balls shifting offset is L/D. This offset is generally judged to be qualified according to the specific requirements of customers. The general criterion is that L/D is less than 25%. It is easy to observe the inner cavity of the solder balls through two-dimensional X-ray imaging. 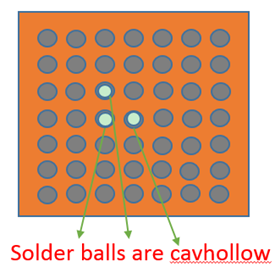 Figure as below shows the X-ray morphology of the cavity of solder balls. The area indicated by the arrow in the figure is the solder ball cavity, the white and bright part on the black background of solder joints. X-ray imaging system in the software are integrated solder ball cavity area calculation function. Generally speaking, if the total cavity area exceeds 25% of the solder ball area, the device is unqualified and needs to be repaired. In order to improve the detection efficiency, two-dimensional X-ray is often used to make a preliminary judgment on the presence or absence of pseudo soldering. While the pseudo soldering is difficult to be detected by two-dimensional X-ray. Therefore, we usually detect whether there was pseudo soldering or not by 3D computed tomography. The quality of BGA soldering includes solder balls’ losing, solder balls’ shifting, pseudo soldering and so on. Some defects will show up immediately, while others will break down in later use. This requires us to give consideration to the detection efficiency in the actual production process, combine 2d imaging and 3D tomography technology to flexibly apply, and troubleshoot some possible faults of the soldering balls, so as to provide more reliable quality assurance for BGA devices.